Recorded his fourth double-double of the season with 17 points and 11 rebounds vs. ORL 4/13… Made seven of eight field goal attempts for 16 points at ORL 4/9… Set a new career-high with four assists vs. HOU 4/1… Recorded a double-double with 14 points and 11 rebounds vs. PHO 3/17... Dropped 10 points and recorded nine rebounds at DEN 2/27… Scored a new career-high 22 points on 8-10 shooting while matching his career-high of 13 rebounds vs. NOP 2/9… Recorded 11 points and eight rebounds at DET 12/7… Matched his career-high with four blocks in his first career start at TOR 1/11… In a career-high 38 minutes, recorded 13 rebounds and scored 15 points at SAS 12/31… Scored 16 points on 7-8 shooting at HOU 11/29… Recorded 19 points and six rebounds in 27 minutes at LAC 11/16… Made his NBA regular season debut, scoring the first basket of his career in three minutes at ORL 11/3. Selected in the first round of the 2013 NBA Draft (22nd overall) by the Brooklyn Nets on June 27, 2013. 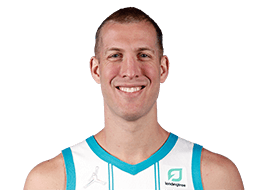 Appeared in 141 games during his four years at Duke, Plumlee averaged 9.8 points, 7.7 rebounds and 1.5 assists in 25.9 minutes... 2012-13 (Senior): Appeared in 36 games, averaging career-highs of 17.1 points per game as well as 9.9 rebounds… Shot just under 60% from the field… Named to the 2012-13 Consensus All-America Second Team as well as All-ACC First Team… Led the ACC in defensive rebounds (260), second in the conference in total rebounds (358), both free throws (173) and attempts (254), field goal percentage (.599) and in total points (615)… One of three Blue Devil team captains... Helped lead Duke to a 30-6 record and an appearance in the Elite Eight of the 2013 NCAA Tournament… 2011-2012 (Junior): Averaged 11.1 points per game and 9.2 rebounds in 34 games (31 starts)… Named to the All-ACC third team, Capital One Academic All-America first team, and was selected to NABC Honors Court, an award that highlights student-athletes who excelled in academics during the 2011-12 season… Led Duke in rebounds and blocked shots... Ranked fourth in the ACC in rebounds per game... Pulled in a team-high 213 total defensive rebounds and tied for the team lead with 99 offensive… Shot 57.2 percent (143-of-250) from the field… Led the team in rebounding 21 times and in scoring six times… Posted 12 double-doubles, second most in the ACC… 2010-2011 (Sophomore): In 37 games, averaged 7.2 points and 8.5 rebounds per game… Honorable mention All-ACC selection ... Also named to the ACC All-Academic team… Shot a team-high 59.3 percent (112-of-189) from the field ... Led the team with 62 blocked shots and 46 dunks… Ranked among the ACC leaders in rebounding (5th) and blocks (T- 6th)… Tied for seventh in the ACC with six double-doubles... Grabbed 10-plus rebounds in 14 contests, including eight ACC games… Led the team in rebounding 21 times… 2009-2010 (Freshman): Averaged 3.7 points and 3.1 rebounds in just over 14 minutes per game... Shot 46.2 percent (49-of-106) from the field… Blocked a shot in 21 games with two-or-more blocks in six contests… Won the 2010 NCAA Tournament as a freshman, defeating Butler 61-59. Born Mason Alexander Plumlee on March 5, 1990 in Fort Wayne, Ind.… Son of Perky and Leslie Plumlee… Father, Perky, is a lawyer and played basketball at Tennessee Tech… Mother, Leslie, is a pharmacist and played basketball at Purdue… Has two brothers, Miles, who plays for the Phoenix Suns, and Marshall, who is entering his sophomore season at Duke… Also has a younger sister, Madeline… Grandfather, Albert Schultz, played basketball at Michigan Tech (1944)... He also played on the U.S. Air Force Service Team in 1945… Uncle, William Schultz, played basketball at Wisconsin-Eau Claire... 1972 NAIA National Runner-up… Uncle, Chad Schultz, played basketball at Wisconsin-Oshkosh… Played AAU basketball with Indiana Elite One and Blessed IJN... Helped Indiana Elite to 2008 championships at the Pittsburgh Jam Fest and Adidas May Classic... Named MVP of both events… Wetmore Scholar and judiciary member of the Honor & Disciplinary Board at Christ School… Received the Christ School Headmaster's Cup, given to senior who demonstrated exemplary character and leadership… Received the W. Fleming Talman Memorial Award for outstanding 3A/4A male athlete in a major sport in 2008.